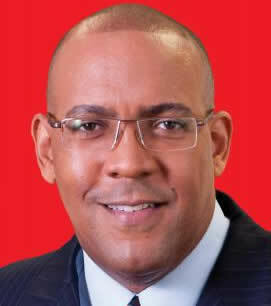 Kerrie Drurard Symmonds is Barbadian Attorney-at-Law, politician, and a current Cabinet Minister. Born on 1 June 1966, Kerrie was educated at Harrison College, Barbados Community College and the Cave Hill Campus of the University of the West Indies (Bachelor of Arts and Bachelor of Laws) and at the Hugh Wooding Law School in Trinidad (Legal Education Certificate). At Cave Hill he had also been a tutor for two years in the Faculty of Social Sciences. As the first ever MP for St.James Central, he left an indelible mark through the "Kerrie Care Development Programme" that resulted in widespread road building and renewal, the introduction of natural gas and bus service to previously neglected areas, and the development of sporting and recreational facilities throughout the constituency. He also assisted in the development of small self-employed businesspersons, coordinated an annual children's summer camp, provided a yearly back-to-school assistance programme and supported churches and social groups by annually providing food hampers to needy persons. At the national level, the attorney-at-law served from 2003-2008 as Minister of State in the Ministry of Foreign Affairs and Foreign Trade, with responsibility for Barbados' hemispheric trade and economic relations, especially with Latin America and CARICOM. He was the youngest person ever to chair the COTED (Council for Trade and Economic Development) group of CARICOM Ministers. He was also Deputy Chairman of Barbados' Joint Parliamentary Committee on Foreign Trade, Deputy Chairman of the Caribbean Broadcasting Corporation and a Director of the Barbados Investment Development Corporation. Kerrie returned to private practice in2008 as an International Trade Law Practitioner while maintaining a general litigation practice. His international trade clients include CARICOM member states and the CARICOM Secretariat. In keeping with his goal of contributing to the social and economic integration of CARICOM, Senator Symmonds works closely with other trade/legal experts assisting in the technical implementation of the European Partnership Agreement between the European Union and CARICOM. After a 2008 election defeat, Kerrie was re-elected to the Barbados House of Assembly in the 21 February 2013 General Election. Symmonds retained his seat in the 24 May 2018 election and was appointed Minister of Tourism and International Transport in the Mia Mottley Administration. Kerrie is the father of one son, Kofi. His non-political interests are scuba diving, snorkeling and a variety of water sports.